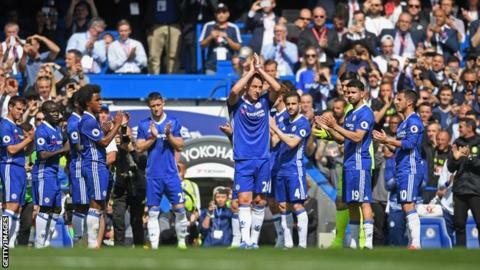 John Terry has admitted his 26th-minute farewell in his final Chelsea game was his idea, with Sunderland boss David Moyes revealing his side agreed to put the ball out to allow the substitution. The Blues captain, 36, received a guard of honour from team-mates as he left in the minute matching his shirt number. Champions Chelsea ran out 5-1 winners against already relegated Sunderland. "I kind of negotiated with the manager to play 26 minutes and come off," Terry told Sky Sports. "I think he wanted to get the boys that didn't play on Monday night against Watford and give them a run-out. It was a compromise between the two of us." In his post-match news conference, Black Cats boss Moyes said: "We knew it was coming and we agreed to put the ball out." Chelsea manager Antonio Conte told BBC Radio 5 live: "I think that we had to find the best for him - to start the game and to be substituted in 26 minutes, his shirt number. "To see our players prepare a guard of honour for him was great, a fantastic idea. "He deserved this. He's a legend of this club, not just this club but one of the best defenders in the world." Match of the Day pundit Alan Shearer said he was "not sure" about the timing of the guard of honour, adding: "It was done with good intentions but I don't think anything should be done that could undermine the integrity of the game." Fellow BBC pundit Garth Crooks was also critical, saying: "This has obviously been set up. I'm a bit uncomfortable with it." It is thought the Premier League is relaxed about the matter. Terry's cameo was his 717th appearance for Chelsea over a 22-year career with the club, during which he has won 15 major trophies. In a tearful address to supporters after the game, he said: "Today is one of the most difficult days of my life. "I've been very fortunate to work with some unbelievable players and managers throughout my career. I'm thankful to every single one of them. "We all have to thank Roman Abramovich. I'd like to thank him and all the board. He's the best owner in world football. "I'd like to thank my wife and my kids for supporting me in this amazing journey I've had. "You are the best supporters in the world, without a shadow of a doubt. You've given me everything. You picked me up when I was down, sung my name when I had a bad game and disappointed you. "I'll come back here one day, supporting the team for years to come." Sunday's victory capped a superb first league campaign for Conte as Chelsea boss, during which he has led the club to 30 wins - the most by any English club in a 38-game top-flight season. They won 15 of their last 16 home games and scored 85 goals, making this their second-best Premier League season in front of goal. They have a chance to win the Double when they take on Arsenal in next Saturday's FA Cup final but Conte says this will only happen if the players maintain their desire. "We are leaving a great moment with my family, the players, our fans," said the Italian in reference to their league triumph. "It's great to have this type of day to celebrate after a season which has been very difficult. "When you win you think everything is simple but it wasn't so - we worked really hard to reach this target. "Now we have today to celebrate and from tomorrow it is important to focus, concentrate and reach another target. "If you ask me if we are favourites [to win the FA Cup] I tell you not. Usually when you win your desire start to be less. "To win the league is a final achievement and we must be happy and enjoy the moment. We have the great chance to play the final of the FA Cup and win but only if we keep the same desire in our soul, our heart."